Researchers at Dana-Farber Cancer Institute have identified natural human antibodies against the virus that causes Middle East Respiratory Syndrome (MERS), a step toward developing treatments for the newly emerging and often-fatal disease. Currently there is no vaccine or antiviral treatment for MERS, a severe respiratory disease with a mortality rate of more than 40 percent that was first reported in Saudi Arabia in 2012. In laboratory studies reported in the Proceedings of the National Academy of Sciences (PNAS), the researchers found that these “neutralizing” antibodies prevented a key part of the virus, known as MERS CoV, from attaching to protein receptors that allow the virus to infect human cells. The research was led by Wayne Marasco, MD, PhD, an infectious disease expert at Dana-Farber. Further experiments are underway that could lead to development of antibody preventives and treatments for MERS, according to the scientists. Investigators from the University of North Carolina at Chapel Hill are co-authors of the report. “This panel of neutralizing antibodies offers the possibility of developing human monoclonal antibody-based immunotherapy, especially for health care workers,” noted the authors. Symptoms of MERS infection include cough, fever and shortness of breath, and can lead to pneumonia and kidney failure. The World Health Organization has recorded more than 250 cases and at least 93 deaths, mainly in countries of the Arabian Peninsula. A number of cases and deaths have been in health care workers and hospital patients. 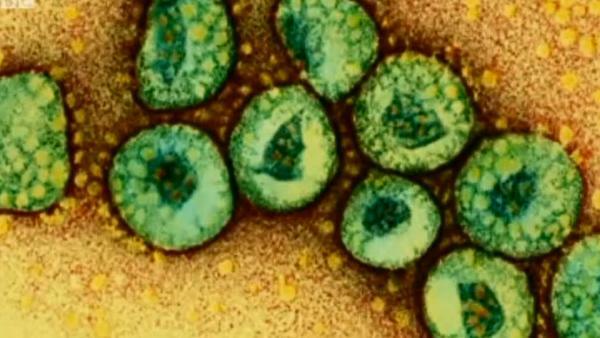 On April 21 Saudi Arabia’s King Abdullah fired the country’s health minister amid a surge in new MERS infections – 49 in a single week. Reports of MERS in Greece, England, France, Italy, Malaysia and other countries have raised concerns about potential global spread of the disease by infected airline passengers. The MERS virus has been found in camels and bats but scientists don’t yet know precisely how it is transmitted to people. The virus is similar to the Severe Acute Respiratory Syndrome virus, SARS CoV, which caused hundreds of deaths in China in 2002 and 2003. SARS was less lethal, having a death rate of about 10 percent. Marasco and colleagues found the MERS antibodies using a “library” of some 27 billion human antibodies that they have created and maintain in a freezer at Dana-Farber; it is one of the largest such libraries in the world. Antibodies are proteins made by the immune system that recognize foreign viruses and bacteria. A neutralizing antibody is one that not only recognizes a specific virus but also prevents it from infecting host cells, so eventually the infection is “cleared” from the individual. The research team plucked seven MERS-specific neutralizing antibodies from the library after using samples of the virus to screen for them. MERS CoV (CoV stands for coronavirus) has on its surface an array of spike-shaped proteins that bind to host cells – specifically to receptor proteins called DPP4 on the surface of cells that line human airways. The neutralizing antibodies identified in the study prevented the virus’ spikes from binding to the DPP4 receptors. The researchers selected one of the antibodies, labeled 3B11, as a “lead” candidate for further research. Marasco said the antibody has been produced in sufficient quantities to begin testing in non-human primates and mice to determine if they protect against the virus. However these studies have been delayed because no good animal model for MERS has been developed, added Marasco. Although the disease hasn’t been seen in North America, “the chance of someone infected with MERS landing on US shores is possible since international travelers that have been to the Arabian peninsula and exposed to the MERS CoV may be asymptomatic at the time of their travel,” said Marasco, whose research on the virus is funded in part by the Defense Advanced Research Projects Agency (DARPA) and the National Institutes of Health. He said he was contacted by DARPA soon after MERS was first reported in 2012 and asked to study the virus from the viewpoint of biological defenses against it. The report in PNAS said laboratory studies of how the virus evolves in response to exposure to neutralizing antibodies suggest that the MERS virus won’t easily shape-shift to evade antibody treatments, as some viruses do. Marasco’s team found that the same mutations that enabled the MERS virus to escape neutralizing antibodies also weakened the virus’ ability to replicate. Marasco added that an antibody-based treatment for MERS would be administered by injection and could provide protection for about three weeks. Read the study at PNAS: Identification of human neutralizing antibodies against MERS-CoV and their role in virus adaptive evolution. Source: Dana-Farber Cancer Institute, adapted.